I thought I’d follow on Nancy’s excellent post on the Mason manuscript uncovered at Penn with a few geographical illustrations of Mason’s journey and his scientific observations. 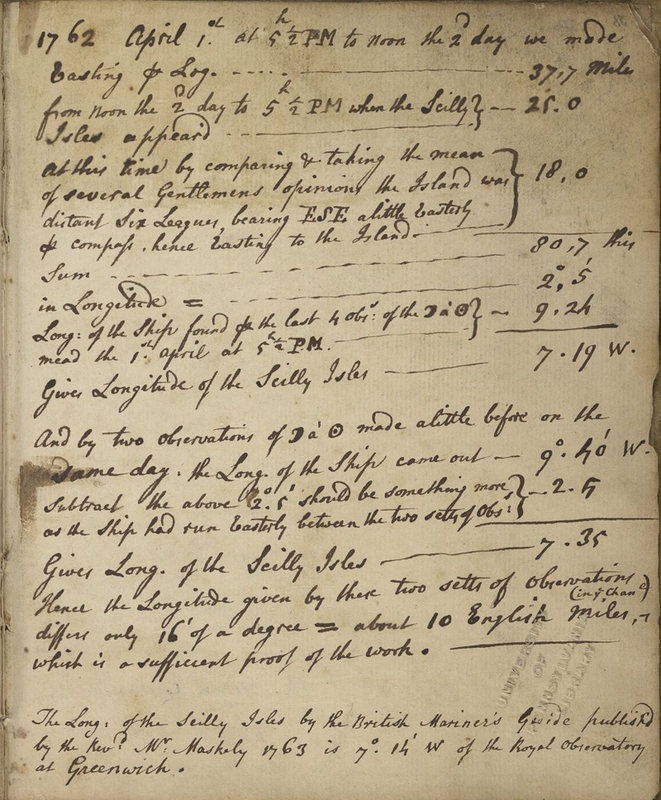 What Mason chose to record in his journal seems befitting of an 18th c. scientific traveler. He noted weather conditions nearly every day as well as animal sightings, like his entry for March 17, 1761 “Saw two Grampo’s blowing water” (Grampus Griseus – a species of Dolphin) or that of March 12: “Caught a shark 9 feet long.” Only occasionally does the human drama of life at sea enter into the log, most notably on March 28, 1761 when he tragically notes “Blackmoor Seaman fell over board & was drown’d in my sight & most of the ships Company”  . 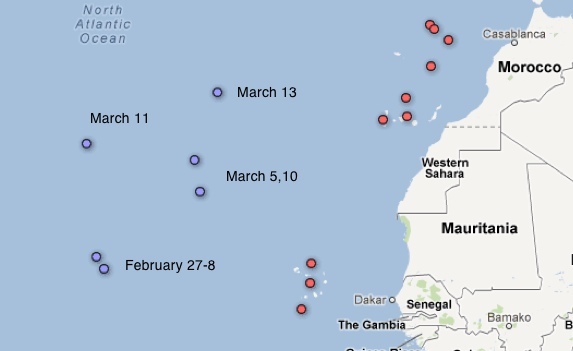 However, the vast majority of entries in the log concern finding the location of the ship. 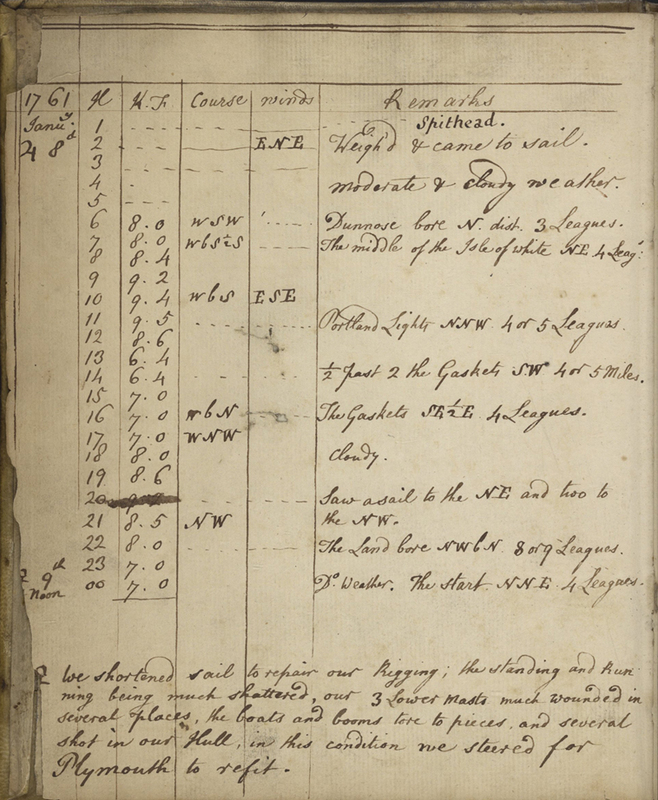 Almost every day at noon Mason took latitude measurements based on the height of the sun and recorded them in his log along with a reckoning of latitude based on the course and speed of the ship from its last known certain latitude (e.g. at a port). Latitude though provides only limited information about location at seas and as Nancy noted in her post, measuring longitude was considerably more problematic. 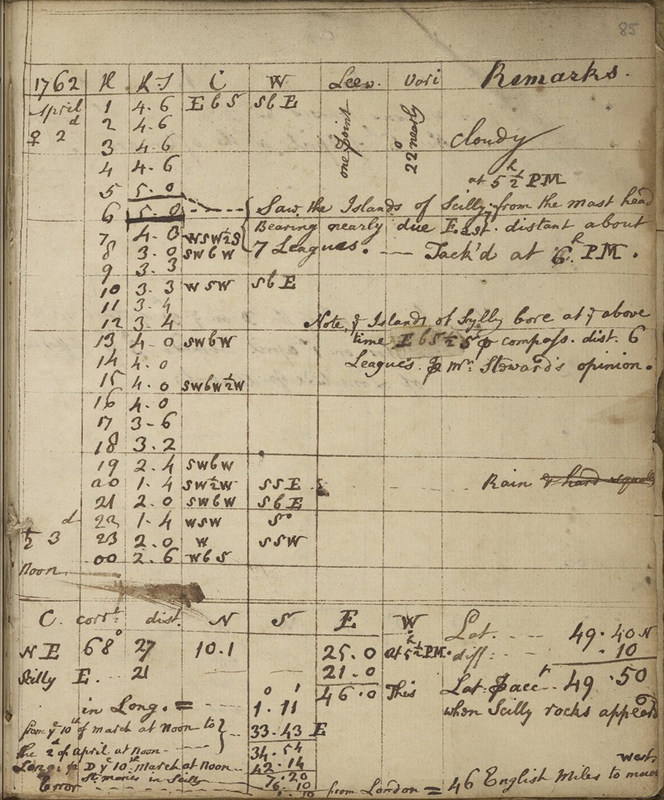 Mason recorded longitude only a few dozen times in his logbook. He calculated these measures based on two different methods, the first involving the crude dead reckoning process derived from the course, heading, and speed of the ship (measured with a log line). I’ve plotted below those 42 days where Mason recorded both Longitude and Latitude in his log. I’ve given each ship its own color, red for the Seahorse (from Plymouth to Cape Town), yellow for the Mercury (Cape Town to St. Helena), and blue for the Prince Edward (St. Helena to Plymouth). Clicking on the map below will take you to a larger map with clickable points for each of the mapped entries including page images and dates. Though Mason recorded his longitude calculations in the familiar Degrees, Minutes, (and more rarely) Seconds format, he did so not always from the meridian of Greenwich. At various points in the log he records degrees of longitude from the Scilly Isles, the Lizard (a prominent landmark in Cornwall), St. Helena, Cape Town, London, and Greenwich. I had to convert these measurements to distance from Greenwich by adding or subtracting the degree distance of these locations from today’s meridian after converting to decimal degrees. Mason’s observations on February 27-8 and March 11 were made using lunar tables and latitude measurements, those on March 5,10, and 13 by reckoning from previous marks. It’s astounding how far off these measures are from each other. Mason hoped to prove the viability of measuring longitude based on lunar observations and at the end of his log provided figures for the last week of his return voyage; one set for each day based on lunar-derived longitude (red), the other on dead reckoning (blue). As you can see, those measurements based on reckoning would have put the ship in mainland France whereas those by lunar measurement were much closer to their intended goal of the Scilly Isles which the ship reached on April 3rd. See the entry here. Possibly a lascar (general term for seaman of South Asian and/or African descent). It had been a busy day of meetings for me. Each time that I returned to my office, I noticed the same number as a missed call on my telephone. Although I tried calling back, I didn’t realize the person who was so eager to speak to me was in England. Around 10:00 in the evening (his time), Jonathan Peacock of Durham County, in the northeast of England, finally reached me by phone. And did he have an interesting tale to tell. In his retirement Jonathan Peacock has been researching Jeremiah Dixon, who was born in Cockfield, County Durham in 1733. In 1760 Dixon was commissioned by the Royal Society to go with Charles Mason (then working as a junior assistant at the Royal Observatory at Greenwich), to Bencoolen in Sumatra to observe the transit of Venus on 6 June 1761. Due to contrary winds and a sea battle with the French Navy, their departure was so delayed that they ran out of time and only got as far as Cape Town, South Africa. There they built an observatory and made a very successful set of observations. Afterwards they went back to St. Helena, an island in the Atlantic Ocean off the coast of Africa, where Nevil Maskelyne (later to be 5th Astronomer Royal) had come to make his observations (unsuccessfully due to the weather) on the East Indiaman Mercury (sometimes known as Mercury Snow). Dixon was then sent back to Cape Town with Maskelyne’s clock (made by John Shelton) to check the force of gravity; Mason stayed in St. Helena assisting Maskelyne. They then both returned to England in January 1762, hitching a lift on a passing convoy of East Indiamen. Mason was on the Prince Edward, and Dixon was on the Falmouth. Mason’s log entry describing the naval battle with a French frigate which forced the ship carrying him to turn back to port. The transit of Venus refers to the alignment of Earth, Venus, and the sun, such that the orbit of Venus across the sun is visible from Earth. In general, predicting transits of Venus had been complicated, although a pattern related to the months of December and June was finally established for 8, 121, 8, and 105 years before starting over. Astronomers such as Charles Mason (1728-1786) sought to witness and record the timings of this astronomical rarity, because the data allowed them to calculate with greater accuracy the distance between Venus and Earth. As a consequence, astronomers would take that calculation to ascertain the distance between Earth and the sun, as well as the distances from the sun to the other planets. Jonathan Peacock was calling me because he realized that Ms. Codex 208, held by the Rare Book & Manuscript Library, was undoubtedly the journal kept by Charles Mason on his altered excursion to Sumatra . Mason had been asked to keep a logbook by the Royal Society because of its extreme interest in navigation and accuracy. In the middle of the eighteenth century a ship’s latitude was comparatively easy to determine from the height of the sun at noon. A person didn’t even need to know accurately when 12:00 noon was; he could go on measuring until the sun was at its peak height, which told him when noon was anyway. The problem, however, was longitude. In the Scilly disaster of 1707 four British ships with more than 1,400 sailors were lost in stormy weather; it was later determined that the main cause for the calamity was the navigators’ inability to calculate accurately their locations. The Royal Society looked to the moon, hoping that reliable assessments could be determined by the lunar position. Although the Society was, in fact, producing lunar tables, in 1761/2 they had not yet been published . To build background information, the Royal Society asked Mason to keep his own record, so its members could see how accurate the ship’s master was in his navigation. -Mason’s log entries describing reaching the Scilly Islands and calculating their position at the end of his return journey in April 1762. This fascinating piece of history now clarifies not only the purpose behind Penn’s anonymous logbook but also its author. 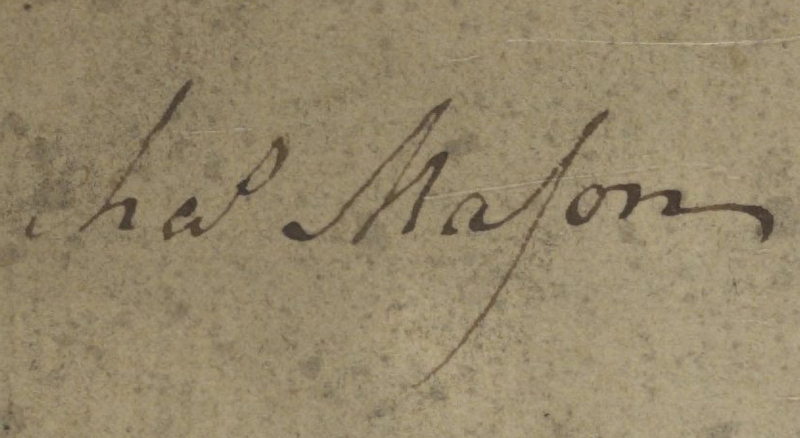 It is definitely written by Charles Mason; in fact, it contains his autograph on folio 87v. It is clearly in his hand, as compared with various pages of his journal made in 1763-8 while surveying in America, (the original is in the National Archives). It is also stylistically similar, for example, in the use of the “astronomical characters” to indicate the days of the week. Finally, he was the only person to travel on that sequence of three ships. In the year following Charles Mason’s trip to capture the transit of Venus, he and Jeremiah Dixon were commissioned to settle a border dispute among British colonies in North America. Their four-year effort resulted in a line of demarcation that formed part of the borders of Pennsylvania, Maryland, Delaware, and Virginia (now West Virginia). The demarcation is known as the Mason–Dixon Line. Through a grant from the National Endowment for the Humanities, a complete digital facsimile, with multiple magnifications, has been made for Charles Mason’s logbook, Ms. Codex 208. It can be viewed at Penn in Hand. Readers everywhere can now study Mason’s notes and calculations. As a start, my colleague Mitch Fraas will be posting shortly about using the logbook to map Mason’s voyages based on the entries for those days during which Mason calculated both longitude and latitude on board ship, a preview of which is shown below. The lunar tables weren’t published until 1767. See letter from Maskelyne dated 24 February 1767: “Messrs. Mason and Dixon, Herewith I send you, agreeable to your desire, the nautical almanac of 1767: also a table for facilitating the computation of the moon’s distance from the sun…” Letter bound into NARA RG59 (302029) Journal of Charles Mason, Kept During the Survey of the Mason and Dixon Line, 1763-1768. 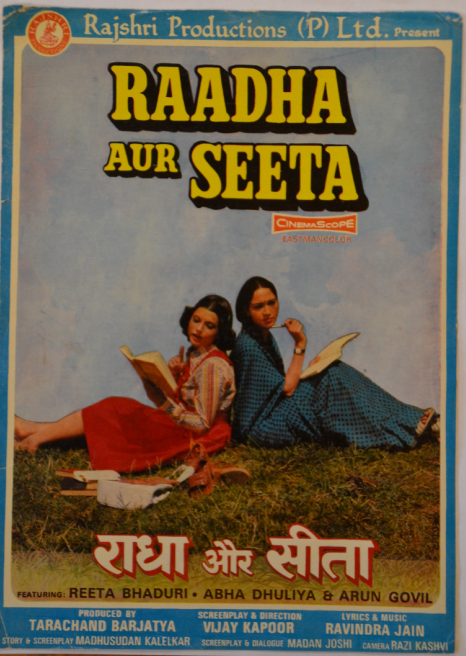 The University of Pennsylvania Libraries has recently acquired a small collection of 71 pressbooks (1929-1980) (1981-2003) from the cinema industry in India centered around Mumbai. Pressbooks were promotional material created by film producers to market films. At at a time when most film companies did their own promotion, pressbooks were given to theatre owners by distributing agencies. Hollywood pressbooks would usually contain information about material that the theatre owner could order to promote the movie, such as handbills, records for the music from the movie or published material. The pressbooks would showcase pictures of common movie posters that could be ordered. Indian pressbooks were completely different. They contained no provisions to order promotional material, but carried content that was descriptive of the movie itself. The books usually contained a small synopsis of the plot, often in two or three languages, commonly English, Hindi, Urdu and sometimes a regional language like Gujarati, depending on the perceived audience for the movie. Since almost every movie was a musical, the lyrics to film-songs were a key feature of these booklets. On occasion, production stills were reproduced in these booklets. Since the early 21st century, independent film theatres in India are being increasingly replaced by multiplexes, and such promotional material has lost its place; as online trailers and other electronic media are becoming popular vectors of promotion, pressbooks might soon be a thing of the past. The pressbooks acquired by Penn are divided into two separate holdings that have been created as chronological categories: Pressbooks from 1929 to 1980 and Pressbooks from 1981-2003. These limits are determined by the numbers of books that the library has acquired, and their years of publication. 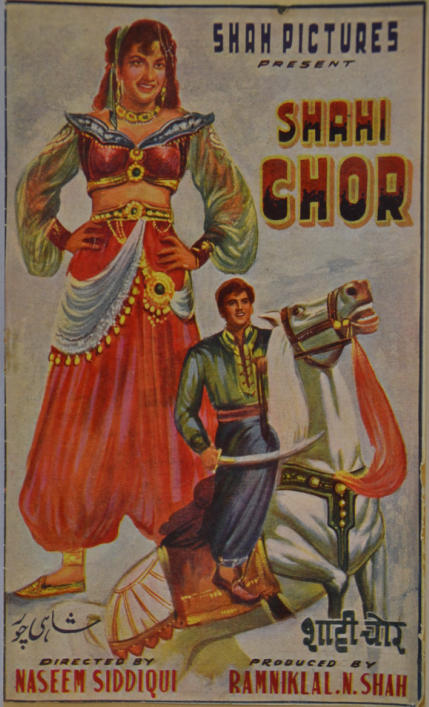 The earliest book is that of a movie called Shahi Chor from 1929, and the last one was published for the movie The Hero in 2003. There are several historically important and popular movies that are represented through the collection, which has There are several historically important and popular movies that are represented through the collection, which has critically acclaimed movies such as Lagaan (2001), debut movies for now established figures in the Mumbai film industry, such as Sanjay Dutt in Rocky (1981), and blockbusters such as Coolie (1983). Several other movies from this collection are important in the history of Indian stage and cinema. For example, the movie Indar Sabha (1932) was the cinematic version of an Urdu drama (considered the first complete Urdu play) written before 1853. This play was one of the canonical scripts for Parsi theater in Mumbai, and inspired Annasaheb Kirloskar to create the magical world of Marathi Natya Sangeet (operatic theatre). Ironically, the cinematization of these stage productions resulted in a decline of musical stage. The press-books are a primary source for graphic design, self-representation and the evolution of cinema across almost a century in the movie industry in Mumbai, and are useful in the study of several other cultural crafts and formations. In honor of the start of a new semester at Penn I thought I would feature one of my favorite unique finds so far which comes from right here in Philadelphia. Penn G3790 1793.M37 . Pen and Ink map with watercolor: 46 x 67 cm. on sheet 51 x 72 cm. 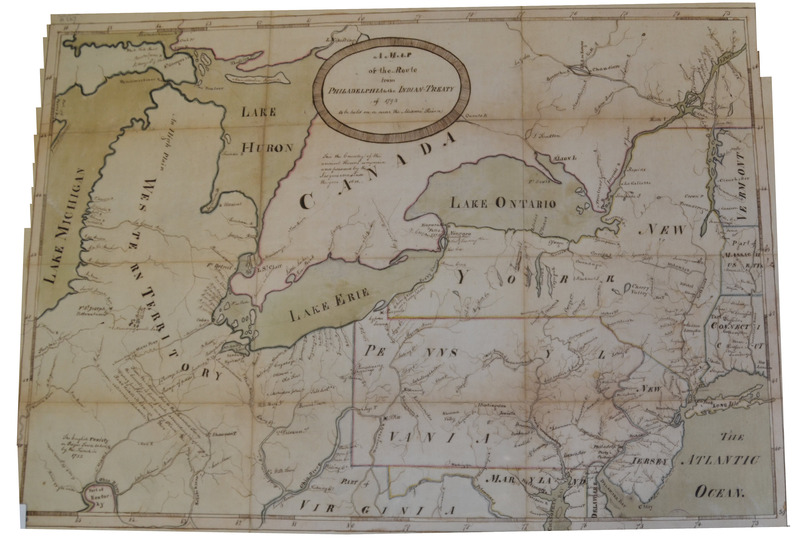 The hand-drawn map pictured above depicts the middle states of the US as well as a substantial portion of the great lakes, Michigan, and the Ohio river country. It was never printed as far as I can tell and was likely commissioned and used internally by some organ of the nascent federal bureaucracy in Philadelphia, most likely the War Department. 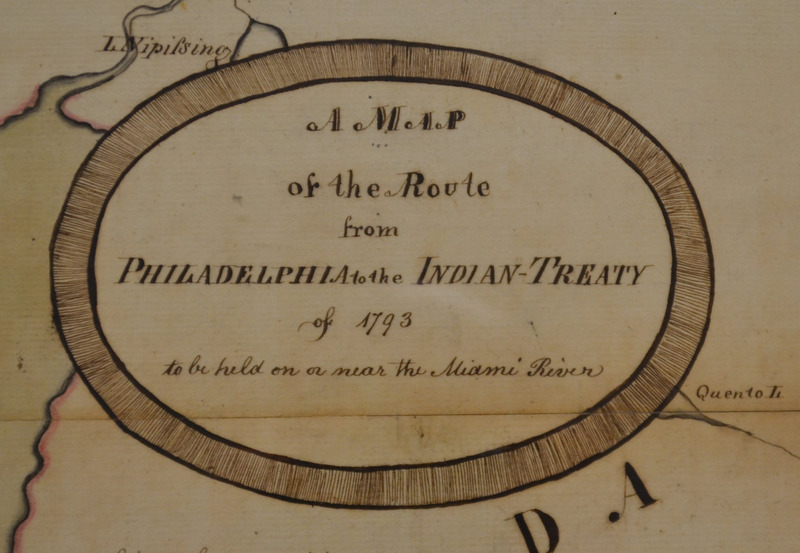 In this case we know a little about when and why the map was created thanks to the penned-in title which states that it depicts the route from Philadelphia to a not-yet-occurred treaty negotiation on the Miami River. For nearly a decade after the American Revolution, the territory beyond the Ohio River was a constant source of conflict between the United States, Native American polities, and European governments. By late 1792 a series of military confrontations and separate agreements left both the United States and several of the most powerful Native American coalitions at an impasse. As Washington’s government in Philadelphia prepared for war to enforce US claims to the trans-Ohio it also could not afford to ignore an invitation to negotiate a settlement. In late 1792 an assembly of American Indian groups (with British backing) invited the US to negotiate terms for a peace which would set firm boundaries for further territorial claims . The meeting eventually took place at Sandusky, Ohio but was originally slated to occur on the Miami [known today as the Maumee] River near present-day Toledo . The map then likely dates to the spring of 1793 when the final location of the meeting had yet to be set. 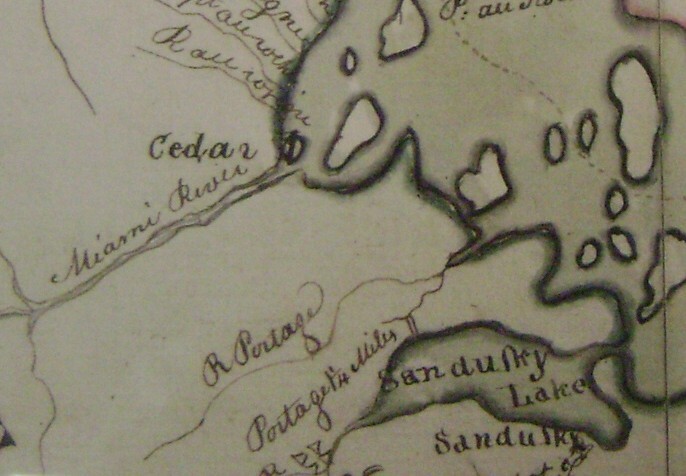 Detail of the place of treaty negotiation showing both the Miami River and Sandusky.